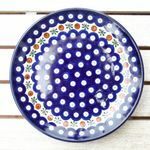 Beautiful Bunzlau dish breakfast plate with a diameter of 20 cm. This plate can of course be used as cake plate, dessert plate or similar. This will make your breakfast table or coffee table unique. The plates are ovenproof and suitable for dishwasher & microwave. Bunzlau ceramic tableware, unique, decorated for centuries in handwork. Breakfast plate - original Bunzlau ceramics from Silesia. Highest quality.